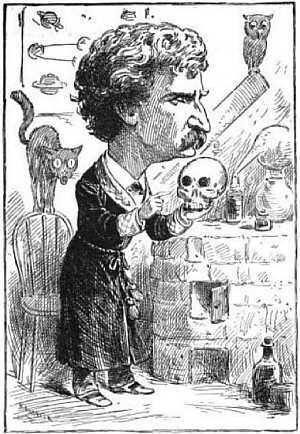 American writer and humorist , the pen-name of Samuel Langhorne Clemens. His novels include The Adventures of Tom Sawyer and The Adventures of Huckleberry Finn. His witty remarks have endured in popularity. Was The World Made For Man? I seem to be the only scientist and theologian still remaining to be heard from on this important matter of whether the world was made for man or not. I feel that it is time for me to speak. I stand almost with the others. They believe the world was made for man, I believe it likely that it was made for man; they think there is proof, astronomical mainly, that it was made for man, I think there is evidence only, not proof, that it was made for him. It is too early, yet, to arrange the verdict, the returns are not all in. When they are all in, I think they will show that the world was made for man; but we must not hurry, we must patiently wait till they are all in. Now as far as we have got, astronomy is on our side. Mr. Wallace has clearly shown this. He has clearly shown two things: that the world was made for man, and that the universe was made for the world—to stiddy it, you know. The astronomy part is settled, and cannot be challenged. We come now to the geological part. This is the one where the evidence is not all in, yet. It is coming in, hourly, daily, coming in all the time, but naturally it comes with geological carefulness and deliberation, and we must not be impatient, we must not get excited, we must be calm, and wait. To lose our tranquility will not hurry geology; nothing hurries geology. It takes a long time to prepare a world for man, such a thing is not done in a day. Some of the great scientists, carefully ciphering the evidences furnished by geology, have arrived at the conviction that our world is prodigiously old, and they may be right, but Lord Kelvin is not of their opinion. He takes a cautious, conservative view, in order to be on the safe side, and feels sure it is not so old as they think. As Lord Kelvin is the highest authority in science now living, I think we must yield to him and accept his view. He does not concede that the world is more than a hundred million years old. He believes it is that old, but not older. Lyell believed that our race was introduced into the world 31,000 years ago, Herbert Spencer makes it 32,000. Lord Kelvin agrees with Spencer. Very well. According to Kelvin’s figures it took 99,968,000 years to prepare the world for man, impatient as the Creator doubtless was to see him and admire him. But a large enterprise like this has to be conducted warily, painstakingly, logically. It was foreseen that man would have to have the oyster. Therefore the first preparation was made for the oyster. Very well, you cannot make an oyster out of whole cloth, you must make the oyster’s ancestor first. This is not done in a day. You must make a vast variety of invertebrates, to start with—belemnites, trilobites, jebusites, amalekites, and that sort of fry, and put them to soak in a primary sea, and wait and see what will happen. Some will be a disappointments–the belemnites, the ammonites and such; they will be failures, they will die out and become extinct, in the course of the 19,000,000 years covered by the experiment, but all is not lost, for the amalekites will fetch the home-stake; they will develop gradually into encrinites, and stalactites, and blatherskites, and one thing and another as the mighty ages creep on and the Archaean and the Cambrian Periods pile their lofty crags in the primordial seas, and at last the first grand stage in the preparation of the world for man stands completed, the Oyster is done. An oyster has hardly any more reasoning power than a scientist has; and so it is reasonably certain that this one jumped to the conclusion that the nineteen-million years was a preparation for him but that would be just like an oyster, which is the most conceited animal there is, except man. And anyway, this one could not know, at that early date, that he was only an incident in a scheme, and that there was some more to the scheme, yet. The oyster being achieved, the next thing to be arranged for in the preparation of the world for man, was fish. Fish, and coal to fry it with. So the Old Silurian seas were opened up to breed the fish in, and at the same time the great work of building Old Red Sandstone mountains 80,000 feet high to cold-storage their fossils in was begun. This latter was quite indispensable, for there would be no end of failures again, no end of extinctions—millions of them—and it would be cheaper and less trouble to can them in the rocks than keep tally of them in a book. One does not build the coal beds and 80,000 feet of perpendicular Old Red Sandstone in a brief time—no, it took twenty million years. In the first place, a coal bed is a slow and troublesome and tiresome thing to construct. You have to grow prodigious forests of tree-ferns and reeds and calamites and such things in a marshy region; then you have, to sink them under out of sight and let them rot; then you have to turn the streams on them, so as to bury them under several feet of sediment, and the sediment must have time to harden and turn to rock; next you must grow another forest on top, then sink it and put on another layer of sediment and harden it; then more forest and more rock, layer upon layer, three miles deep—ah, indeed it is a sickening slow job to build a coal-measure and do it right! The Palaeozoic time-limit having now been reached, it was necessary to begin the next stage in the preparation of the world for man, by opening up the Mesozoic Age and instituting some reptiles. For man would need reptiles. Not to eat, but to develop himself from. This being the most important detail of the scheme, a spacious liberality of time was set apart for it—thirty million years. What wonders followed! From the remaining ganoids and asteroids and alkaloids were developed by slow and steady and pains-taking culture those stupendous saurians that used to prowl about the steamy world in those remote ages, with their snaky heads reared forty feet in the air and sixty feet of body and tail racing and thrashing after. All gone, now, alas—all extinct, except the little handful of Arkansawrians left stranded and lonely with us here upon this far-flung verge and fringe of time. Yes, it took thirty million years and twenty million reptiles to get one that would stick long enough to develop into something else and let the scheme proceed to the next step. ‘E’s a kind of a giddy harumfrodite–soldier an’ sailor too! From this time onward for nearly another thirty million years the preparation moved briskly. From the Pterodactyl was developed the bird; from the bird the kangaroo, from the kangaroo the other marsupials; from these the mastodon, the megatherium, the giant sloth, the Irish elk, and all that crowd that you make useful and instructive fossils out of—then came the first great Ice Sheet, and they all retreated before it and crossed over the bridge at Behring’s strait and wandered around over Europe and Asia and died. All except a few, to carry on the preparation with. Six Glacial Periods with two million years between Periods chased these poor orphans up and down and about the earth, from weather to weather—from tropic swelter at the poles to Arctic frost at the equator and back again and to and fro, they never knowing what kind of weather was going to turn up next; and if ever they settled down anywhere the whole continent suddenly sank under them without the least notice and they had to trade places with the fishes and scramble off to where the seas had been, and scarcely a dry rag on them; and when there was nothing else doing a volcano would let go and fire them out from wherever they had located. They led this unsettled and irritating life for twenty-five million years, half the time afloat, half the time aground, and always wondering what it was all for, they never suspecting, of course, that it was a preparation for man and had to be done just so or it wouldn’t be any proper and harmonious place for him when he arrived. And at last came the monkey, and anybody could see that man wasn’t far off, now. And in truth that was so. The monkey went on developing for close upon 5,000,000 years, and then turned into a man–to all appearances. Science Quotes by Mark Twain. What Is Man? : and Other Philosophical Writings, by Mark Twain. - book suggestion.